The Picidae bird family is adapted to tree life. It lives in oak and pine woodland forests. Toe arrangement is ideal for bark gripping, beaks are styled for pecking, long, sticky tongues are good for catching wood-boring insects, and skull size and orientation prevent brain impact injuries. Picidae species include; woodpeckers, the northern flicker, and sapsuckers. 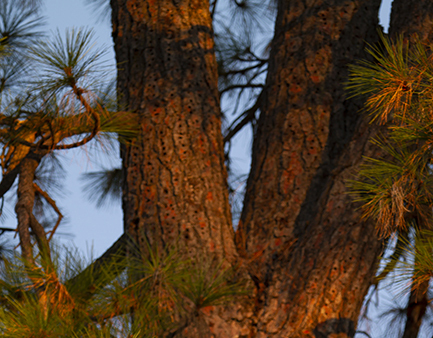 This article focuses on family commonalities, then concentrates on acorn woodpecker behavior patterns. Woodpeckers are an indicator species for healthy oak woodlands. 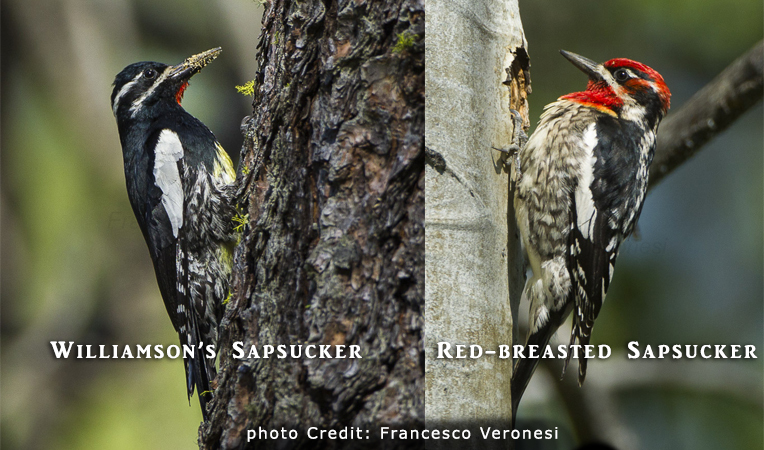 Woodpeckers, flickers, and sapsuckers inhabit areas with multiple oak tree varieties because each type produces a different amount of nuts per year. Acorns dropped by woodpeckers aid in tree proliferation. Drumming – proclaims territory and attracts a mate during mating season. Usually occurs during March through June mating season. Other control methods – bird feeding stations, nest box placement, offering poles and other granary sites. 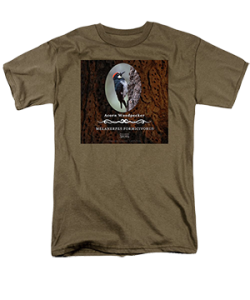 Woodpeckers are protected under the Migratory Bird Treaty Act of 1918. 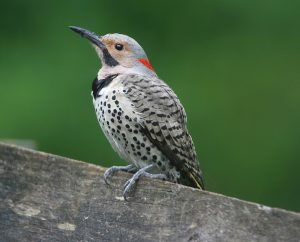 ”All woodpeckers are protected under the Migratory Bird Treaty Act (MBTA). This law says: “No person may take (kill), harass, possess, import, export, transport, sell, purchase, barter, or offer for sale, any migratory bird, or the parts, nests, or eggs of such bird except as may be permitted under the terms of a valid permit…” Control methods that do not harm the bird or an active nest are allowed for most species.” -U.S. Fish & Wildlife Service. (See link below). 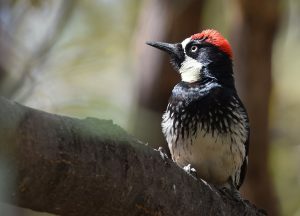 The industrious acorn woodpecker may be best known for constructing granaries. A granary, also known as a ‘mother’ or ‘pantry’ tree, is an older tree with thick bark. Borehole depth doesn’t spill sap that would spoil the nut. A snag or telephone/power pole can also serve as a pantry. Granaries are built by multiple generations of bird families. They require constant maintenance. As nuts dry, they shrink, causing them to loosen. A loose nut can be stolen, so acorn woodpeckers move them to smaller holes and continually check for tightness. Gathering more nuts than is needed is known as hoarding. Hoarding is used to remain in place year-round. A single bird can gather up to 100 nuts per day in a harvesting territory that ranges between 12-15 square miles. Acorn woodpeckers are highly social. Family units can be as large as fifteen. Usually there are several mating pairs with the females sharing a sister relationship. Grown children or siblings remain in the group to care for young and maintain granaries. Cooperative behavior (adult birds opting not to reproduce) is an usual phenomenon that has been the subject of a long-range study by UC Berkeley and Cornell University scientists. If you liked this story, you might also like California Quail – Happy Under Cover. 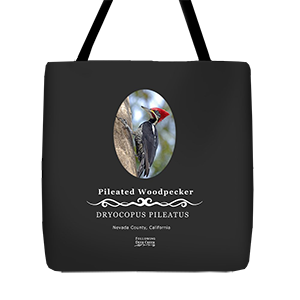 Have you observed Picidae in Nevada County not mentioned in the article? If so, please leave a comment in the comment section below.